Last night I had a sort of epiphany, or an ‘aha! moment’ as Mary Barra would have us say. We were sitting around a restaurant table discussing global warming and the iced water I asked for came in a heavy glass bottle that had been imported all the way to Malaysia from Northern Italy. Why? Can’t we find water in Malaysia? Doesn’t it rain here just about every day, just as the evening rush hour commences? Can’t we collect some of it and make it suitable for human consumption? Just how much pollution was created just so I could “enjoy” this Italian rainwater that to me tasted remarkably similar to the bottle of tap water that I have in my fridge at home. Truth be told, the water that enters my house from the local water company is sometimes quite muddy in colour, but then I did what all my neighbours did and got myself a fandangled water filter that leaves me with crystal clear water, suitable for human consumption. It isn’t rocket science, guys! It does sometime feel like humanity has no place in the natural world. We seem to contribute little of value, besides correcting our mistakes; in fact, sometimes I do wonder if we are even from this planet. There has been this global push to blame the poor old automobile for global warming when we do not look at our own habits and how they may indeed be harming the world that we live in. I have previously beaten the drum about the amount of gases that contribute to global warming being issued from the nether regions of cows, but how about now we look at the humble bottle of mineral water that we consume with our meals. Read also: It’s Smog Season In China, Therefore It’s Time To Stop The Cows Farting And The Chinese From Eating Meat! 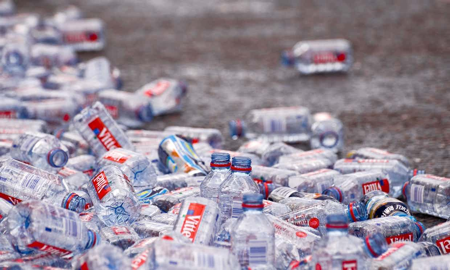 In the past 30 years in the UK, the consumption of bottled water has mushroomed from 30 million litres to two billion litres, for which residents paid about GBP2 billion for the pleasure. Of that total in the UK, most of the water does actually come from springs, but still 22% of all the water consumed there comes in plastic bottles that we carelessly discard after use. These are the very same bottles that litter our beaches and end up clogging landfill sites. More significantly though, and whilst much of the water we consume in South East Asia is derived from mineral-rich springs, according to a report carried by Channel News Asia, much of the water – including market leaders like F&N’s Ice Mountain and Coca-Cola’s Dasani – is sourced from the humble water supply. The bottled water market in Singapore is said to be worth at least SGD134 million per year, and these two brands made up over 50% of the market in Singapore last year, according to Euromonitor data. All this in a country where the humble tap water far exceeds international standards. In many ways, though, it gets worse. F&N, when contacted by Channel News Asia, stated that much of the water is simply repacked Malaysian tap water, the very same stuff that the restaurant in Malaysia would not serve me, and where this story began. In a way, it is one hell of a business. You take water that cost you about nothing and then sell it at about a 1000% mark-up. What sort of society are we in when a litre of bottled tap water that you buy from a gas station convenience store costs more than the petrol you put into your vehicle? I am sure that the throw away culture that has people willingly discarding the plastic bottles that once contained water that costs 1000 times more than it cost to make has some environmental advocates seriously doubting the future of mankind. But here is the rub – despite the lack of sweeteners, carbonated, or fizzy water, can contain up to 11 times the amount of salt that you would expect to find in normal tap water. Drinking just one litre of fizzy water per day can significantly contribute to your salt intake. 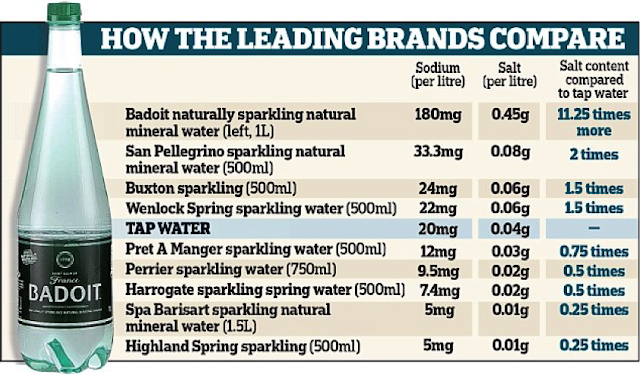 Of course the amount of salt varies significantly, so helpfully I have found the graphic below in the UK’s Daily Mail to put your mind at rest and of course to avoid being sued by any Bottled Water Manufacturer. There are some places that are starting to make a stand on the plastic water bottle; for instance, San Francisco has already banned them. The simple fact remains that in the US alone, more than 1.5 million barrels of oil are consumed to make the bottles for the water drunk there, and that could power a lot of cars. Do I need to say anymore? Is this REALLY the World’s First Flying Car?